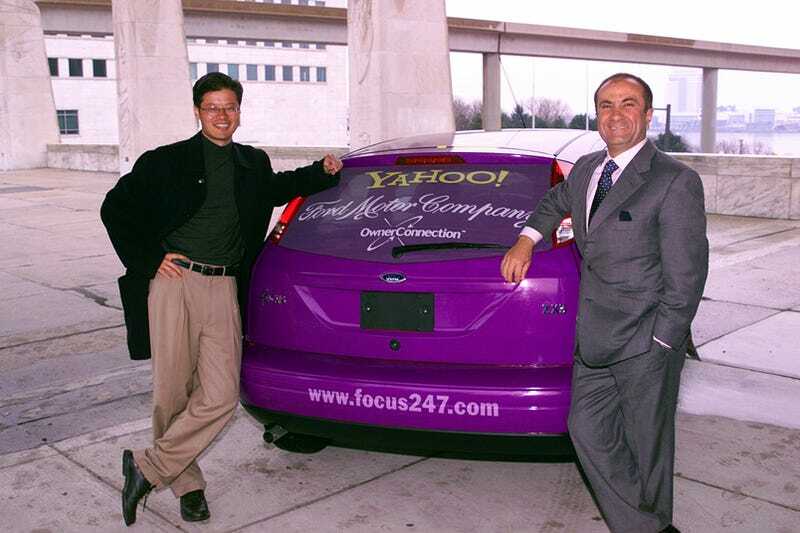 From the archives: CEO Jacques Nasser and CEO Jerry Yang celebrating the Ford-Yahoo OwnerConnection program in 2000. It's nine years later. Which concept seems sadder through the prism of history? Jac Nasser, CEO and president of Ford Motor Company, and Jerry Yang, cofounder and chief of Yahoo!, Inc., laugh in a Yahoo!-wrapped 2000 Ford Focus, Sunday, January 8, 2000, outside Cobo Hall at the North American International Auto Show in Detroit, Michigan. This photo, of course, was taken pre Carpocalypse, before Yahoo!, Jac Nasser, Jerry Yang, the Ford Focus and the Detroit Auto Show all took a nose dive into total crapdom.